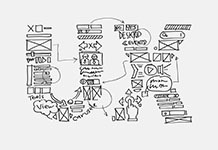 Good UX Design starts with common sense | Intrasoft International S.A.
A couple of years ago there was no room in the design industry for a UX designer. Today, UX designers are necessary in any digital creative endeavor. But is User Experience just another term for common sense? The creation of intuitive, simple and straightforward experiences is what UX is all about. Could we possibly fall into a creative trap if we consider UX the absolute synonym of common sense? The reality is that UX design needs a much clearer understanding than simply calling it common sense design. Even though the fundamentals of UX design START with common sense, one needs to dive deeper in order to discover the truth depth of UX Design. Common Sense; ready, set, go! It is acknowledged, even between UX designers, that the starting point of a good UX design starts with common sense. This is only the starting point, because as the work progresses one needs to dig so much deeper. As far as UX design is concerned, common sense translates into years of research, behavioral psychology and habit creation. UX designers strive to remove undue thought and friction from the user journey and to achieve that, the experience created needs to provide to the user clear, obvious options. The design starts with a simple set of questions. What is the easiest, least invasive way to allow the user to achieve their goals? How can the user get from A to B in the fastest, surest way possible? Is Common Sense really that simple? Actually, it takes extraordinary work to deliver what seems like a common-sense experience and ensure it has been perfectly built. In order to seem obvious, a design must be handled with extreme creative care. What is really UX design? UX design is still evolving and the truth of it all is, that we still have a long way to go before we completely comprehend the true depth of UX design. Just ask #IntrasoftPeople; we could never imagine designing and creating a website without a UX Designer on the team.